If one is truly repentant, it can certainly be worked out. As we mentioned earlier, since living beings turn their backs on enlightenment and unite with defilement, being turned by the wearisome defilement of the five desires, their karmic obstacles become deeper and deeper. On the other hand, the Buddhas can transcend the sordid defilements of the five desires and avoid creating additional karma. Because living beings have such heavy karma, one who wishes to become a Buddha and realize the Way must first repent of his karmic offenses. If one hopes to become a Buddha without being repentant, it's like cooking sand and hoping to get rice. You can cook for as many eons as there are sands in the Ganges River, but you'll never succeed. Now, to refresh everyone's memory, I will very briefly explain this passage of repentance for everyone. From eons without beginning, up to today, the karma from the offenses we have committed cannot be reckoned. First of all, we have slandered the Triple Jewel: the Buddha, the Dharma, and the Sangha. Among these, the offense of slandering the Sangha is the gravest, because the members of the Sangha represent the Buddha in propagating and transmitting the Buddhadharma. Therefore, one is not allowed to eradicate the offense of slandering the Sangha through repentance. What is an “icchantika”? It's a Sanskrit word which means “incomplete faith” and “lacking good roots.” If you try to speak the Dharma to these people, they don't want to listen. They may even tell you straight out,“I don't believe it.” Wouldn't you say they've cut off all their good roots? “Killed my father and mother” also includes the offenses of killing an Arhat and killing a sage. One example is Devadatta killing a Fourth Stage Arhat. Next, “shedding the Buddha's blood” is also an offense for which repentance is not accepted. Many people wrongly think this offense only means actually cutting the Buddha's body with a knife when the Buddha was in the world. In fact, after the Buddha entered Nirvana, damaging Buddha images in any way also counts as this kind of offense. This includes peeling the gold paint off the Buddha images, ruining Buddha images, and so forth. Although this does not harm the Buddha physically, it is equivalent to cutting the Buddha's body with a knife. “Defiling the Sangharama” means profaning the pure temple. An example would be if married couples living on temple grounds engage in indecent activities, eat meat, kill living creatures, and so on.“Ruining the pure conduct of others” means inducing left-home people who were pure and undefiled to break the precepts. Repentance is not allowed for this either. 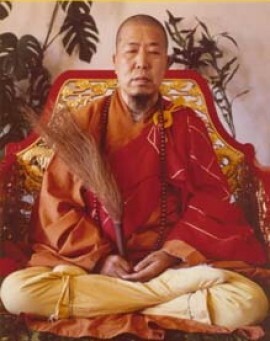 “Burning and wrecking stupas and temples” means setting fire to and damaging Buddhist temples, just as Feng Yuxiang set fire to White Horse Monastery and Shaolin Monastery in the past.“Stealing the property of the Sangha” means using improper methods to seize the wealth and property of the permanent dwelling. The people who do that all hold deviant knowledge and views. They think they are right, and they insist that there is no cause and effect. Acting rebelliously, they stop at no evil. There's nothing they won't do. How can they not fall? Finally, we'll talk about “being intimate with evil friends, and turning away from good teachers.” In Confucianism, evil friends are called “harmful friends.” For example, we should not associate with tramps, gangsters, and so forth, because they are considered evil friends. Some people associate with such harmful friends and gradually stray onto the wrong road themselves. Refusing to listen to their teachers' exhortations, they will do all kinds of evil. They can't tell the difference between right and wrong, and they act in upside-down ways. Wouldn't you say they are pitiful? The various offenses mentioned above are all extremely serious, yet very easy to commit. If one has unfortunately committed them already, what should be done? Don't be disheartened, because “Offenses may fill the skies. Repent, and they disappear.” Offenses have no shape or form, and if one is truly repentant, it can certainly be worked out. No one should give up on himself and be resigned to falling!